News & Notes from West Ridge Animal Hospital: Don’t Let Your Pet Get Away With Having Dog Breath! Don’t Let Your Pet Get Away With Having Dog Breath! Think about how you felt when you woke up this morning. Were you fresh and alert? Were you groggy and uncoordinated? Did your back ache? How was your breath? Chances are your mouth tasted like you licked the bottom of your shoe, and your teeth felt “fuzzy.” That fuzz is plaque, a combination of bacteria, saliva, and food particles that have made themselves at home on the enamel of your teeth. Plaque starts forming just four short hours after brushing your teeth. If left there long enough it can calcify and become tartar, which is a rigid crusty deposit that can only be removed by a professional dental cleaning. Now, think of how fresh your breath feels after brushing your teeth. Remember the feeling of how smooth your teeth are when you run your tongue over them? How often do you brush your teeth each day? Dogs and cats get plaque and tartar buildup just like humans. 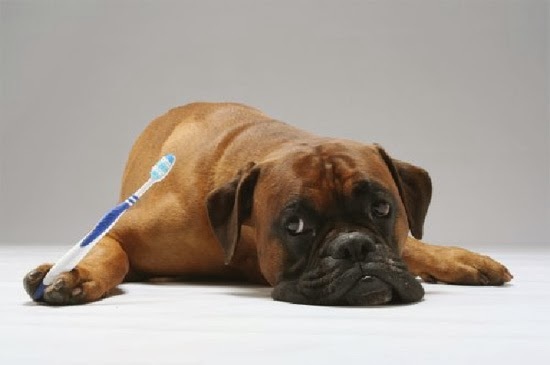 How long has it been since you brushed your pet’s teeth? Professional dental cleanings are vital in maintaining your pet’s oral health, just as they are for humans. Imagine how your mouth would taste, smell, and feel if you only went to the dentist for cleanings once or twice a year, and did not brush and floss at home in between those visits. YUCK! It is the same idea for our pets. Routine professional cleanings are extremely important, but we don’t want to skip out on home dental care between those. Ask your vet about how to brush your pet’s teeth, what chew toys and treats are safe and effective for cleaning plaque, and to learn about other great methods and tools for giving your pet that same clean fresh feeling you enjoy after brushing. Don’t let your pet get away with having dog breath! alas, I have no thumbs.